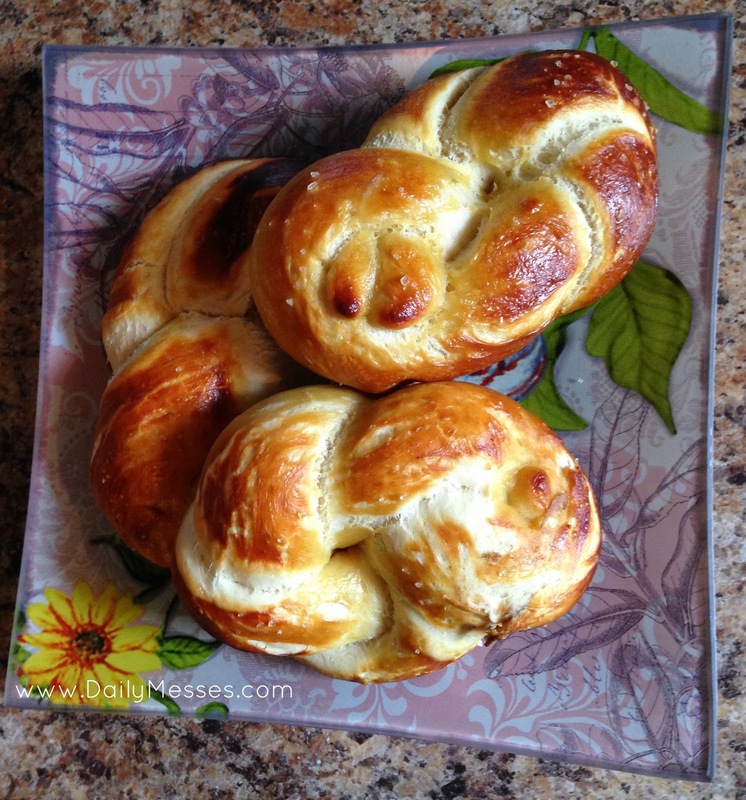 I love soft pretzels, so we decided to try to make our own at home. It was really easy and super yummy. I had to fight to even get one before they were all gone! The recipe is really easy and most of the prep time is in letting the dough rise. I think next time I make these, I might also make a batch of beer cheese. 1. In a stand mixer, combine sugar, salt, and water (the 1 ½ cups warm water). Evenly sprinkle the yeast on top. Let sit for about 5 minutes, or until it starts to foam. 2. Using the hook attachment, mix in flour and butter to yeast water. Combine on low until mixed together. 3. Mix on medium speed until dough becomes smooth and it pulls away from the sides of the bowl, about 5 minutes. 5. Preheat oven to 450 degrees F with the racks in the middle positions. 7. Mix together the 10 cups of water and the baking soda in a large pot. Heat to a boil. 8. Divide dough into 12 equal pieces. 9. On the silicone mat, evenly roll out dough pieces to become a 20 inch rope. 10. Fold in half and twist the two sides together. Pinch the ends together. 11. Fold in half and tuck the pinched end into the top hole. 12. Place the dough twists into the boiling water, 1 or 2 at a time, for 30 seconds. 13. Remove dough with a slotted spatula or spoon to help the water drain. Place on cookie sheet. Leave 3 inches in between pretzels. 14. Brush the tops with egg wash and sprinkle with the Kosher salt if wanted. 15. Bake 12-15 minutes or until golden brown. Make sure to rotate pans (between racks and direction facing in oven) halfway through baking. 16. Allow to cool on cooling rack.